A strip this wide with a voided filling does take a bit of time to complete. Still, I’m chugging along, about a quarter of the way through, perhaps a bit more. And I’m thinking on what to do next. I do owe a ton of holiday socks that need to be knit between now and the end of the year. But I’m just not engaged to produce socks right now. What I want to do is to keep stitching. It’s always a bittersweet moment when a project is within sight of the end. There’s impatience to be done with it and be on to the next. There’s indecision about the direction of the next work. And there’s dissatisfaction with and pride in the current piece mixed 50/50. I can see what I’d have done differently on this one, and I can also point to bits that turned out even better than I expected. 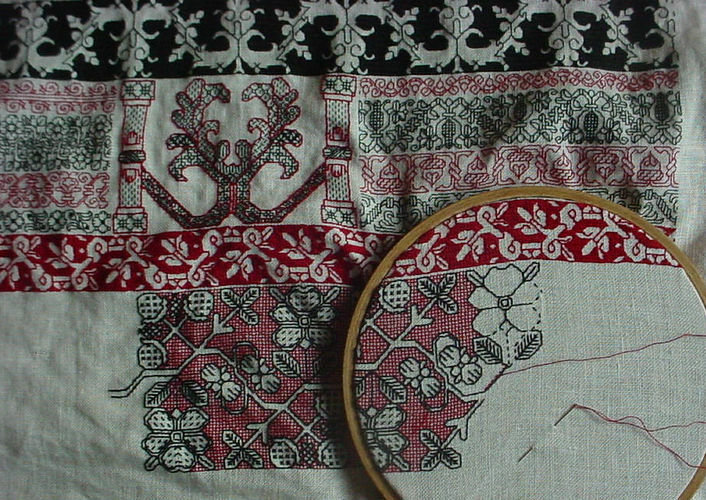 Are you going to finish your blackwork tutorial with the "how to finish/hide beginnings and endings" section? Looking forward to it if so.